The Arab Monetary Fund (AMF) is a regional Arab organization, founded 1976, and operational from 1977. 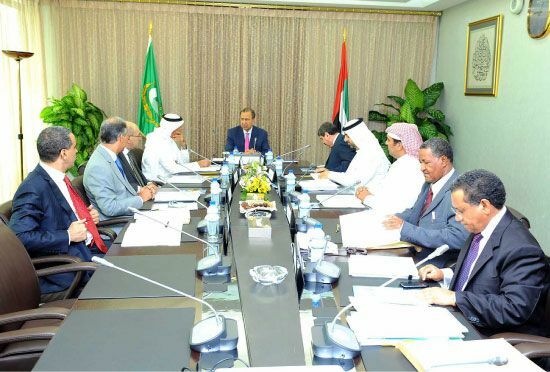 It is a working sub-organization of the Arab League and is headquartered in Abu Dhabi. It is managed by a board of governors, board of executive directors and chairman of the board. To accomplish its goals, the fund provides short and medium-term credit, liberalizes and promotes trade, offers technical assistance to banks and other monetary institutions, helps settle current payments and works with international organizations. The fund requires its member countries to reduce restrictions on current payments and transfer of capital and to coordinate their economic policies. It has a green flag with its emblem consists of an oval shield displayed a stylized map of the Arab world. The oval is flanked by golden leaves, and Arabic name of AMF is placed over the shield.